You need to go back a ways in USA corporate culture, to find much happy days futurism as a genre. The later science fiction is more Mad Max, one of Dawn's favorites, darker and edgy. But American Look is unrelentingly upbeat, produced by Chevrolet in the late 1950s, a tribute to America's designers, or stylists as they were often then called. The camera hovers lovingly over those mod lines we still admire today, though more as retro chachkas for Church of Elvis type palaces, with Austin Powers shag rugs. Per recent anthropological studies, some teenagers were actually cultivating the more juvenile delinquent look back then, in a still hush hush rebellion of Drapes (underdogs) versus Squares (on top). Later we'd get The Beatles and all that loud music. However, our avuncular, all-knowing narrator is undeterred by these troubling signs of a brewing culture war, and simply reminds us (again and again) how lucky we are to be (white) Americans (no Negroes in this film, nor any of their music). Women get nodding acceptance as stylists until we get to the Inner Sanctum, where Bob appears. Bob smokes a pipe, and his team of men in black, his no nonsense yes men, are anxious to please. They go off to make a car out of clay, a Chevrolet. They then stroke it and worship it, and when Bob reappears, he is pleased. This is really the climax of the film, but we take awhile to wind down after that, have a cig maybe, look at those percolators some more. I've been exploring my Quaker animism more, on Synergeo of late. Plus I was just over at Jimmy and Kim's, watching this documentary about Fridtjof Nansen, the Nordic explorer. His team had to kill lots of non-humans to stay alive, and sometimes felt really bad about it, "like we were committing murder" he says in his journal. But you can't technically "murder" a non-human, right? I never got a degree in "White Man law" as some Oregonians call it, so I can't really say that I know the answer. In any case, legal representation for animals makes plenty of sense, not necessarily as advocates of their owners (who may be part of the problem), and not necessarily as pioneers of new rights, although that is an important function of cases sometimes i.e. to set precedents. Just get someone trained and articulate before the judge to speak on the nonhumans' behalf, not to moralize so much as to expedite reaching an equitable solution. In other contexts, humans lavish attention and care on their pets, treat them with utmost respect. Horses in particular, get a lot of appreciation, for what they give back. But an animal shouldn't have to be "pleasing" or "affectionate" or "a moneymaker" to deserve protection under the law, principles already established in the case of we humans (I at least know that much from my readings in Anglo jurisprudence). Of course the logical objection to this view is "who will press charges on behalf of a non-human?" -- we don't have many rules for that. However, in the medical profession we have the role of "advocate" in the sense of "looking out for" or "in the corner of." Often a spouse or good friend plays this role, accompanies a patient on appointments, provides coaching and oversight, helps the patient navigate the system. I have no problem envisioning a prenuptial agreement in which the horse owner couple agrees ahead of time, that in the event of a messy divorce, the animals will have independent advocates, much as we already have from child welfare agencies. Non-humans and children have much in common, in terms of their suffering severely abrogated civil rights, a fact many have remarked on besides me. Narnia has been conquered by Aguirre types (Telmarine, Taliban or whatever), complete with the right accents and swarthiness. They treat Narnians like conquered (and feared) Aztecs or Incas (Aslan would know), and mount a Lord of the Rings style attack on this ruined Mayan Temple, its basement full of ancient iconography from the last Narnia movie. OK, so I was in the wrong mood for a long (long!) epic battle. Good seeing Ents again, though these ones weren't talkative. Tara thought the acting was excellent. I thought too much leaning on the sound track and reaction close ups for effect. No real suspense or personal growth in the characters. Susan gets nowhere with her Prince. Aslan keeps wanting to make the same point. A dreary, repetitious day dream, while waiting for the tube in machine world? Maybe not such good storytelling from Dumbledumb this time? So maybe I just miss my Ice Queen OK? There's more hope now that I've seen her alive again, never mind Edmund's macho fantasy of doing her in. Most Iraqis don't actually believe those silly media stories about how they'll all begin killing one another on religious grounds, once the occupation ends. In the last twenty times an occupation has ended, that never happened (the Brits warned of it too, in the early 1900s). Things usually get better, when the wannabe back seat driver goes home. The question most Iraqis are focused on: when will the last foreign soldier and/or privatized combatant finally quit the country? That'll be a first step towards normalizing relations. Especially interesting to Iraqis is that all three presidential candidates seem to still harbor fantasies of permanent bases; another USA president living in a dream world, so what else is new right? Nixon's sure was surreal. This was the wrap up, so I tried to go back and hit most of the main points. I also shared more geek lore, including recent gossip around OLPC (my XO made a reappearance, along with my plastic box of cardboard polyhedra). Each student got a one page summary of our scope, plus a signed certificate. I admittedly dwelt on the polyhedra rather a lot, looking at the 6, 4, 3, 1 volume relationships. I tend to not have much faith in my peers when it comes to sharing this basic info. Some of my Python source code files likewise reflect this peculiar obsession, a result of my training as a buckaneer. WMBS or optionally WBS refers to White Man's Burden Syndrome, named for the poem by Rudyard Kipling, ostensibly war propaganda to encourage the US invasion and occupation of the Philippines at the turn of the last century, although in hindsight easy to read in a sarcastic tone. WMBS, or White Man's BS, is a psychopathology tracing to the quasi-science of Economics and the early work of Thomas Malthus to collate global assets and come up with some realistic-seeming science fiction for his day. His results were darkly dystopian and fed a twisted, apocalyptic mindset wherein mass killings and die-offs should be welcomed as a means to raise living standards for those better off. The East India Company founded Haileybury College in England to train its young employees in business, the military arts, and the special skills of religious missionaries. By 1800 it became necessary to initiate the task of making an Earth inventory, that is, to find out what was out there in the way of natural resources, population, land, and other tangible assets. The first man assigned the official responsibility for this enormously vital job was the head of the Department of Economics of Haileybury College. This man was Thomas Malthus, who, in 1805, postulated the idea that humanity is multiplying its numbers at a geometric rate while increasing its life-support capability at only an arithemetic rate. As a result, it has been universally concluded by the power elite that only a relatively few humans are destined to survive successfully in generations to come. The Malthusian theory thus provides a rationalization for the necessity of somehow getting rid of large numbers of people, any people, in any way -- even genocide. With the Malthusian theory as the power elite's philosophical guide, this becomes an acceptable objective because, they believe, Earth will never be able to support the progeny of so many anyhow. From this point of view, genocide -- then as now -- is accepted as all but inevitable. Who cares and why be concerned? This was the science fiction of Britain's elite managerial class, or call it dystopian futurism. As such, it's a lot like the apocalyptic visions of many Xtians, presenting with many of the same symptoms (fatalism, misanthropy, superstition). Western civilization especially seems to have this style of thinking as a quirk, almost a hallmark. Of course such thinking is dangerous because, as we know, prophesies have a way of being self-fulfilling, because people get used to the rhythms, believe in the music, become entranced, mesmerized by the mental imagery. WMBS is especially endemic in North America, which partly explains why this area is so full of mentally crippled people. Children are sometimes deliberately infected by their elders with these dangerous memes in the name of "science" (a form of abuse). We still need a DSM code for WMBS so we can bill its treatment to insurance. Obviously a lot of folk have been infected with it. More self-education is often sufficient to effect an inexpensive cure. Seems more economics and social policy than physics but we might address this in energy terms, recognizing currencies trade against futures, in whatever commodities, gold, dollars, oil. Relative to other currencies, the dollar has been weakening of late, as speculators rush into a different mix of holdings, not a new phenomenon. To speculate is to imagine a future, dystopian, utopian, and invest accordingly, which is all implicitly about energy channeling i.e. how to use that daily dose of solar, mixed with weather, add agriculture and fuels, in longer term programming -- quite the volatile mix, called "life" in biology, or just biomass if you don't care (did others see that story about PETA asking for in vitro meat?). So for example Warren Buffet sees reasons why the Mars and Wrigley operations should meld, but merger is only one thing that happens. There're also spin-offs, and our Silicon Forest is full of 'em (typical event: big company CTO uses savings to spearhead new company, like that woman taking off from OLPC with her cool secrets -- Mary Lou Jepsen of Pixel Qi). As we all know as well, oil companies are mostly repositioning, through branding and marketing, as energy companies, have several technologies to play with, but don't want to jump the gun, all shy of the beta versus vhs debacle, or hd vs blueray or whatever -- i.e. who wants to bet on what horse, is the name of the game. I think the hard focus on hydrogen by some leading fossil fuelers was a play for time, to keep more electric at arm's length (too scarily popular per that movie Who Killed the Electric Car). I think a key question facing whatever next president will be why is the dollar weakening, which can't be separated from that sense of direction i.e. investors want companies with a coherent story about where they're going, not just where they've been. Trading in dollars is somewhat commensurate with a USA management class knowing what it's talking about, but then there's no monolithic mega-conspiracy I hope we all know that (many Internet lists don't, and it's tiresome). We're a lot of partially overlapping networks, if you hadn't noticed, some stronger than others, but sometimes small and nimble is what you need to be (echoing myself here...). The office of USA president provides great overview and if there's a brain equal to the job, we'll get some good, positive results. You might read that as a dig at George W. but it ain't, not here to diss anyone this time, just acknowledge that's a tough office (I've got my own, different challenges, more private sector in flavor, though tilted towards NGO work). The gas tax issue is something for the public to bat around in the blogs or whatever, because it's simple and easy to talk about (both pro and con). You need a selection of such "no brainers" going, just to keep people focused, when they're not doing NFL, NBA, Cartoon Network or whatever. That sounds snooty-elitist I'm sure, so let's just pretend I'm W.C. Fields (check YouTube? ), did go to Princeton so am supposed to be a snob (not a frat boy though -- didn't have those, lived with witches (good ones)). PS: re our zombie truck system (driverless long haul options, using a lot of existing infrastructure, earlier posts to this list): I finally caught The Simpsons episode wherein Homer and Bart inherit a truck in a steak eating contest (winner dies), only to find truck union conspiracy around autopilot feature many are using (but not talking about). Homer blows the secret but earns kudos for dodgy driving, while meanwhile Marge and Lisa have a stuck doorbell problem. I took Tri-Met today, which got me there with minutes to spare. It's quite a hike from where 14 leaves me, to Cramer in PSU, but Portland is a smallish town, and I wasn't lugging speakers, nor even a laptop this time. Our main focus today was a somewhat exhaustive investigation into a simple game framework I put together since last week, after gauging student interests and abilities. The emphasis here is on building a reading familiarity with core Python such that slower paced tutorials will already come with some context. We visited Showmedo and watched some of Jeff Rush's Intro to IPython, also Dive Into Python, and of course the Python docs themselves, to prepare them for self-study at whatever rate. I also continued underlining the fact that Python comes in several flavors, including a proprietary version atop Nokia hardware or whatever, all in accordance with its liberal license. IronPython and Jython implement the language in C# and Java respectively. Stay tuned for more options. I also explained how I use Python in my own case professionally, sometimes to study the geometry of geodesics, per stickworks.py and polyhedra.py -- my 4dsolutions.net stuff will remain at their disposal, as adventures continue. So the idea is to run these like summer camps and/or inservice trainings for teachers wanting to have the right stuff, based on both state of the art standards and popular stereotypes. Thanks to Hackerteen and such, kids expect induction into the mysteries of the Internet rather early, so if you're not talking IP numbers in grade school (nothing to do with intellectual property -- namespace collision), that might mean you're in one of those pre-21st century institutions (more like prison -- do they block Youtube even for teachers? a telling sign). The private sector, somewhat in competition with the military, is hungry for students who actually know something about how the world works, information not liberally shared in most workaday schools, where the old management philosophy was to train 'em for factory jobs or other rank and file occupations, with college not the default (those were called prep schools). Of course nowadays everyone expects college, but with high tuition that's still not really normative. Per today's blog post, we in the Silicon Forest (there's that we again), are chomping at the bit to revamp the K-12 experience such that it's more up to date as to the mix of skills it teaches, even as we stick to many classical topics, such as trig, some calc, stats, and metrology (the art of measuring). Geography ties it all together on some level, in that we always start with the spheroidal planet, zoom in on applications of interest. Google Earth plays a big role, other KH-derived services. What teachers get selected for such training? I'm thinking the military will try to set up a pipeline for some of its own teacher-trainers, but this won't preclude collaboration at the federal level, as there's tax money involved either way and traditionally the private sector is allowed to synergize (make a profit) by field testing and/or guinea pigging in that area. However, I'm thinking the military mission will become more like what NGOs already tackle daily, in terms of disasters, with the violence quotient far lower, given its inappropriateness as a reflex (earlier / recent threads). That's why as a Quaker I'm not so bent out of shape about all the cold war baggage we're inheriting as next generation Fuller Schoolers. Cold war means psychological, and we Quakers don't preach against so-called "inward weapons" only outward, i.e. jihad, in its less uncoordinated (awkward) sense, is ok, has many parallels even in Buddhism. The military and civilian spheres have long overlapped in medicine, where the job of physicians is to tend to wounds, however inflicted (in whatever theater). The direct relevance of open source engineering principles (a form of design science -- plus we've already had more than a decade of it), to healing the wounded, doing medical things, is just starting to become obvious. The old legal system, which had no concept of "legally free" (as in "criminal to be selfish with"), had less to offer good doctors than the spanking new legal system of today, which owes a lot to the engineering community. Greater Portland, hailed by Christian Science Monitor as an open source capital, is well positioned to pioneer in this area between biochemistry, electrical engineering, genetic science, and front lines medicine. We're not that dependent on the traditional military economy, which is mostly a junk recycling business these days. That frees us to think outside of that box, and we're doing it. The education system is adapting pretty quickly I'd say. Looking forward to the Bucky play in October. Stay tuned. 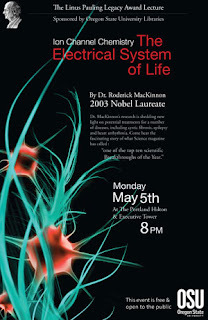 Tonight Tara and I bused downtown for a lecture by Roderick MacKinnon, a professor of biophysics. Then we checked out the Cinco de Mayo scene on the waterfront, rode the ferris wheel. Thanks to Julian for the heads up on this Pauling Legacy Award Lecture. Oregon State has been giving out this award biannually since 2001, for outstanding work in areas related to Linus Pauling's research in chemistry. MacKinnon, like Pauling, is an X-ray crystallographer looking at molecules, albeit bigger and more complicated ones, such as these ion channels within the cell membrane, devices for releasing positive charge. I was telling Tara on the way over that a good study technique, often better than taking notes during a lecture, is to just listen with rapt attention and do a recall shortly thereafter. I learned this technique from my Evelyn Wood Reading Dynamics course in the Philippines. Tiny "ion pumps" chug away in the background, fired by ATP, keeping all those cell membranes charged up like capacitors. A lot of calories go into keeping up that electrical tension. The mechanical discharge of potassium ions, through these various types of channel, variously activated, is like a "wave" in a football stadium, where people progressively stand up and sit down, causing a ripple along the nerve or whatever. The storytelling was very intelligible and historical, tracing the evolution of our understanding of electricity through a lot of big names, Ben Franklin's included. Per usual for this class, I showed Warriors of the Net, in which our warriors are these intrepid little IP packets, like trucks inside of tubes, our Internet. We went over some elementary trigonometry so these students could better appreciate how a Pythonic expression like "[(cos(radians(n)), sin(radians(n))) for n in range(0, 360)]" is actually making a list of points in a circle when plotted. Most of our time was spent tweaking vfun.py, some beginner examples of using VPython for fun (and for learning). Having hit some high notes around a Biotum class on day 1, we're mostly settling for function level syntax on day 3, practicing basic flow: if and loop statements. Named arguments may be passed in any order, or dropped entirely given defaults, which is what keeps our VPython functions (for cylinder, for sphere... for pyramid) so simple and sane. We played with my jungle.py some though, just to keep the flavor of more object oriented code (foxes eating bunnies in this case -- no visuals). I downloaded and installed wxPython with demos while students worked on their projects, for an impromptu segment on widgets programming, having gotten some GUI-related questions. We also looked at Pygame a little, but both have a steep learning curve, so best to already know Python. We also toured Sourceforge a little, talking about how geeks collaborate on new code, share projects. That's not really the focus of this course however. Perhaps one day soon, Saturday Academy will offer classes on CVS, Mercurial, Bazaar... on Apache. So many topics, so few Saturdays. IronPython 2.0 beta 2 is out today. I'm downloading for testing. This is one of my favorite philanthropic projects, aimed at getting more free music samples and production tools to those eager to express themselves musically. 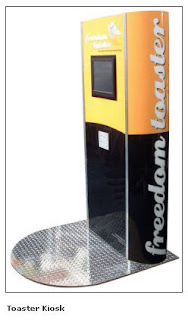 Or, if it's not specifically music that interests you, but computers more generally, the Freedom Toaster is potentially a goldmine of legally free assets and information. Just make your selections, insert your CDs, and burn. Get what might take days to download, in just minutes.